On April 16, on the first day of the 17th session of the UN Permanent Forum on Indigenous Issues in New York (USA), a delegation of the Mejlis of the Crimean Tatar people held a side event "Situation of Human Rights in Crimea" under the aegis of the Ukrainian Permanent Mission at the UN, a member of the Mejlis of the Crimean Tatar people, the director of the news agency QHA ("Crimean News") and Radio Hayat Gayana Yuksel reported on her Facebook page. The Deputy Chairman of the Mejlis of the Crimean Tatar people Akhtem Chiygoz spoke about the critical situation of the indigenous people of the occupied peninsula and stressed that the situation is deteriorating every day. “Our children have no future in the Russian Crimea. Today, the President of the forum Miroslav Lajčák said the important thing, that the problems of indigenous peoples should be solved, and not just set out on paper,” he said. In turn Gayana Yuksel spoke about the problem of freedom of speech in the Crimea and the persecution of civil journalists. “I spoke not only about the lack of freedom of speech, but also about the possibility and importance of daily communication with compatriots in Crimea through QHA and Radio Hayat. Special attention was paid to the pressure and persecution of civil journalists, who in fact remained the only source of objective information from the Crimea. Very briefly managed to outline the situation with media coverage of the so-called restoration, and in fact the destruction of the unique object of the Crimean Tatar culture - the Khan-Sarai," she noted. An employee of the ATR TV channel Elmaz Asanova stressed that ATR continues to be one of the main sources of communication with the occupied Crimea. “Elmaz Asanova told about the situation with the ATR channel and about the conditions under which the TV channel continues to work now, remaining one of the main sources of communication with compatriots in the Crimea, in the mainland Ukraine and in the diaspora," Gayana Yuksel wrote. Lawyer Suleyman Mamutov added that on the annexed peninsula violations of the rights of the indigenous people of the Crimea continue, as well as banning the activities of the Mejlis of the Crimean Tatar people, which is a representative body of the Crimean Tatars. "Violations of the rights of the Crimean Tatars are categorized into two groups - a general violation and pressure on the Crimean Tatars, and a violation of the rights of the Crimean Tatars as the indigenous people of the peninsula," he said. 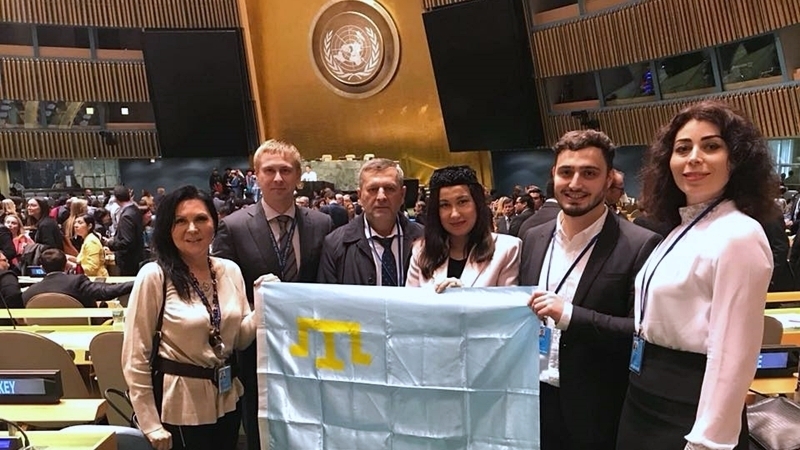 QHA reported that the delegation of the Mejlis of the Crimean Tatar people participates in the UN Permanent Forum on Indigenous Issues, which takes place from 16 to 19 April. The forum will focus on respecting the rights of indigenous peoples to their lands, territories and resources.